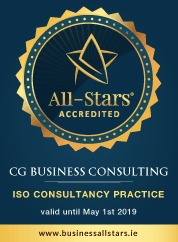 Your organisation could benefit from a FREE ISO 27001 Consultation with CG Business Consulting. How will ISO27001 benefit your business? Innovate, broaden your customer base and operate confidentially, knowing your data is secure. What is ISO 27001 Information Security Management? ISO 27001 is the international standard for information security management. It outlines how to put in place an independently assessed and certified information security management system. This allows you to more effectively secure all financial and confidential data, so minimising the likelihood of it being accessed illegally or without permission. With ISO 27001 you can demonstrate commitment and compliance to global best practice, proving to customers, suppliers and stakeholders that security is paramount to the way you operate. Information is a valuable asset that can make or break your business. When properly managed it allows you to operate with confidence. ISO 27001 Information security management gives you the freedom to grow, innovate and broaden your customer-base in the knowledge that all your confidential information will remain that way.